Royal Paws® Pet Transportation provides your cat safe, stress free transportation nationwide. 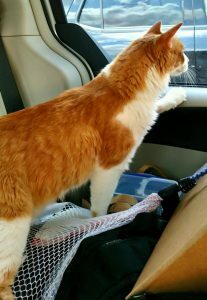 We offer private cat transport services short or long distance for state to state trips or across the country and all of Canada. Our company has been successfully moving pets since 2000 and we strive to create a healthy, happy travel environment for your cat. With no other pets in our vehicles, there is no risk of illness and the stress of bulk traveling with strange animals is eliminated. Royal Paws® Pet Transportation is the best and safest choice for young kittens not fully vaccinated, shy, senior, feral or special needs or nervous cats. Your cat will travel with us crate free (crating your cat is also an option upon request) in comfortable SUVs, or if you require your own vehicle at your pet’s destination, Royal Paws® Pet Transportation can drive your personal vehicle. We specialize in quality service for one way permanent move relocation or round trip, two way vacation destinations with your pet.